Our range of products include manual l-sealer, automatic l-sealer spls-504a, shrink tunnel automatic l- sealer, auto carton sealer machine, automatic l-sealer and automatic l- sealer with shrink tunnel. Backed up by our years of experience, we are offering high-quality Pallet Stackers to our clients. 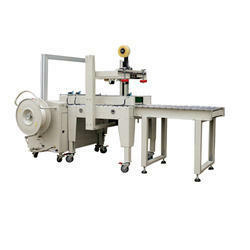 SPLS-5045M Manual Type L-sealer machine can convey the products into shrink tunnel for shrink packaging after sealing & cutting. This machine is equipped with shrink tunnel to reach higher working capacity. L-sealer machine is suitable for shrink packing electronic products, hardware, software, foodstuff, printing, pharmacy, floor, ceramics etc in small amount. We are importer and exporter of superlative quality Automatic L-Sealer SPLS-504A. SPLS-5045A Automatic L-seal cutting machine is a fully automatic unmanned L sealing cutter, widely used for lot production pipelining with high efficiency. The machine is equipped with the auto film feeding & perforating device and adjustable product infeed conveying table in order to meet different requirements from different products. SPLS-5545A has a tight lock device specially designed for packing small products. Adopt aluminum alloy cutter with DUPONT Teflon coating that is thermally stable and antis ticking to ensure good sealing without cracking, coking or any smoke pollution. The film feeding length is controlled and regulated by magic eye and counter. There is an inductive motor for the auto collection of film waste. Simple size change over. No need to exchange any molds or any bag making devices. The machine can be connected with the production line to carry out an unmanned operation. The automatic L-seal cutting machine is suitable for lot shrink wrapping in various industries, such as software, foodstuff, cosmetics, printing, pharmacy, flooring, ceramics, beverage and hardware etc. 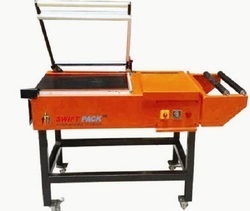 Backed up by our years of experience, we are offering high-quality Shrink Tunnel Automatic L- Sealer to our clients. 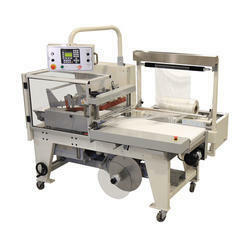 We are importer and exporter of superlative quality Auto Carton Sealer Machine. 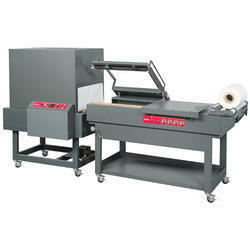 We are importer and exporter of superlative quality Automatic L-Sealer. Known for its robust construction, the offered product is resistant to wear and tear. The offered machine is also widely regarded for its anti-corrosive properties. In addition to this, the entire range of machines offered by us is highly popular for its hassle free operation and perfect finish. We are offering Automatic L- Sealer With Shrink Tunnel to our client.